She follows her everywhere to make sure she's safe. 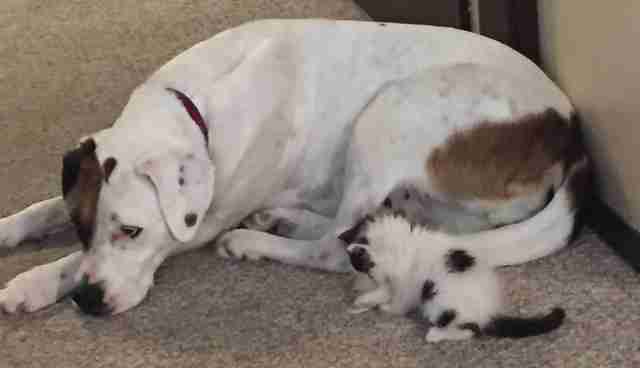 When a couple finally adopted a dog, they were unsure how she might get along with other animals - until the dog met a kitten named Roxxy. Opal's parents adopted her from their local animal shelter in mid-September after fostering her for a few weeks. 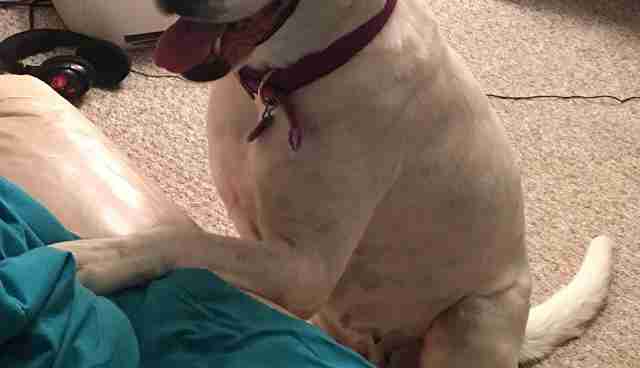 The 6-year-old dog adores her new home, and can't get enough of her mom and dad. "She loves being petted," Macy Thorne, Opal's mom, told The Dodo. 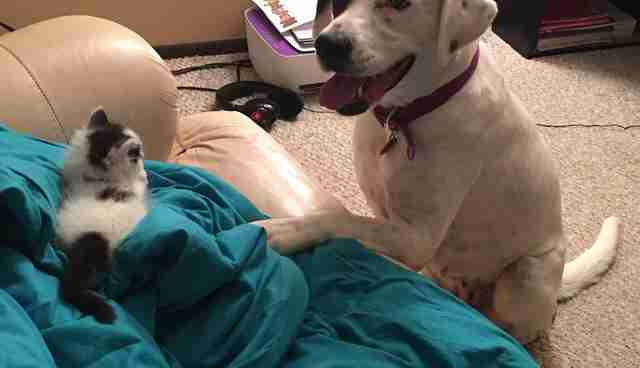 "When you try to stop petting her she'll paw at you and lay her head in your hand." 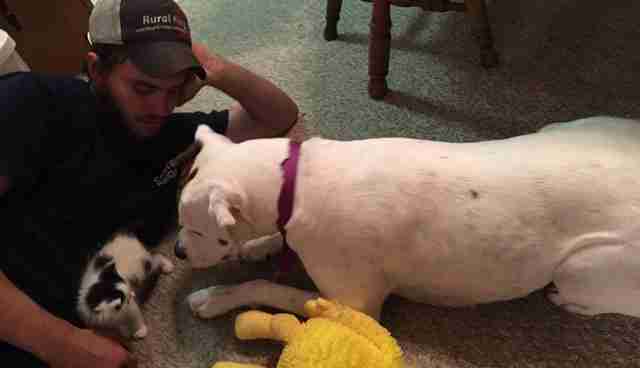 The couple was so thrilled with how adopting Opal turned out that they thought they might eventually like to adopt a little kitten, too, but they weren't sure how Opal would react. The couple got a chance to find out, however, when Thorne's sister's boyfriend needed someone to cat-sit his 6-week-old kitten, Roxxy. 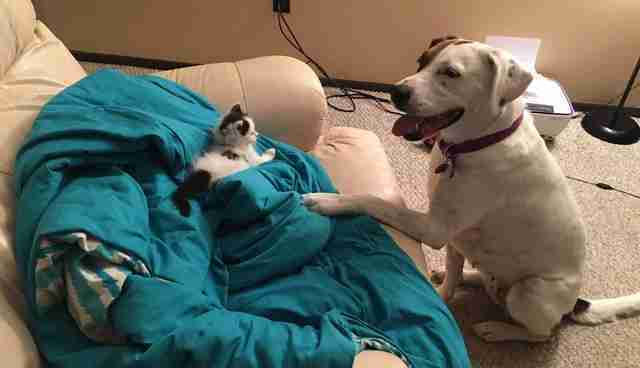 "We weren't entirely sure how Opal would react to the kitten," Thorne said. "We have no idea of Opal's past before the shelter and had no way of knowing if she would be okay with cats." 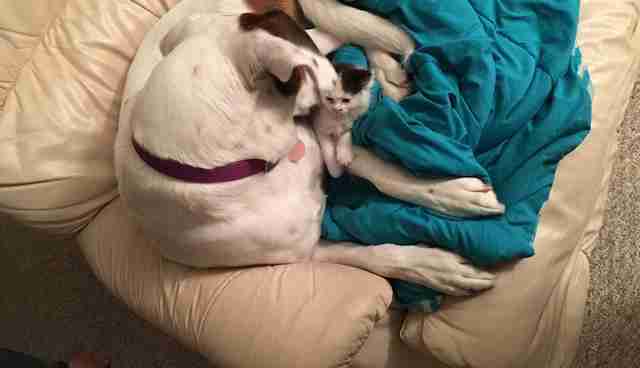 When Roxxy arrived, Opal was so excited about greeting all the new people in her house that she didn't even notice the tiny kitten at first - until Roxxy let out a loud meow. From that moment on, Opal was absolutely obsessed. "Opal loved Roxxy from the minute she saw her," Thorne said. "She immediately went in Mommy mode. Opal kept trying to clean her, pick her up, followed Roxxy everywhere she went." Little Roxxy had never met a dog before and was at first very unsure about it all, but Opal soon won her over with her constant love and attention. Wherever Roxxy is, Opal has to be there too. 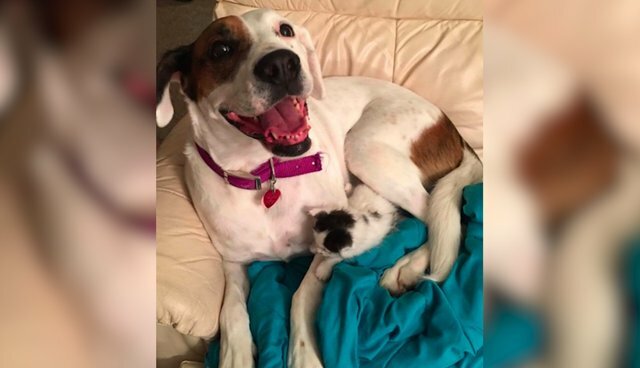 She refuses to let the little kitten out of her sight, and treats her like her own baby. Even though Roxxy won't be living with Opal forever, the two are now lifelong friends, and Roxxy showed everyone that Opal can definitely get along with anyone. Opal is the happiest dog whenever Roxxy is around, and is clearly going to make the best big sister ever.